I hope you love a good beauty giveaway because I have a gorgeous one today, courtesy of the lovely people over at Penelope Hope. 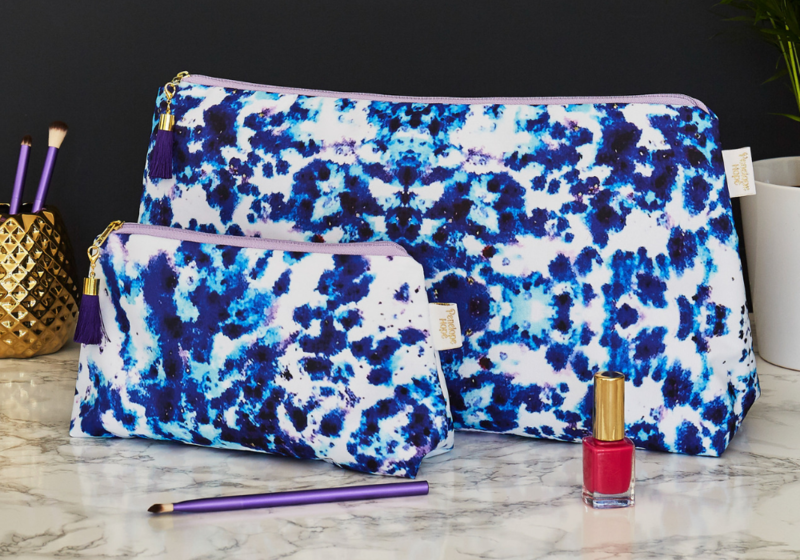 You have the chance to win ONE of these stunning washbag sets (choose from my top 3 favourites) worth £62. The team will even personalise them for you with a gold monogram. What a fabulous New Year’s treat! Before I show you the sets let me tell you a little more about Penelope Hope. Penelope Hope is a light-hearted oasis of calm to put a smile on your face when the day has been a little bit too hectic. Find out more from their website HERE. All of the Penelope Hope designs are carefully created in house by Nadia Newton on the small island of Guernsey. Inspiration comes from holidays and travels to tropical paradises as well as Guernsey itself where Nadia grew up. The business was launched in 2015 with luxury cushions, fabrics and lampshades in vibrant colours & playful prints, which are at the heart of Penelope Hope. Products offer real quality, luxury & style without taking themselves too seriously. Before too long, the ranges expanded into accessories and kitchenware which suited the colourful designs perfectly. Now there are a lot of beautiful pieces to choose from in the washbag section at Penelope Hope, but I’ve tried to narrow it down slightly and choose some of my favourites. You are able to choose from this little selection for your prize. Each set is made up of a Large ‘Big Trip’ washbag and a coordinating makeup bag worth £54.90 and then the personalisation can be added too which would normally cost £3.99 per bag. This was my first choice from the sets to offer as a potential prize. I love it and hope you do too. The larger bag is very large and can even hold a pair of straigteners. Perfect for a longer holiday or when you simply have a lot things to take away with you. 37cm Width x 20cm Height x 10cm deep at base with sloped sides. 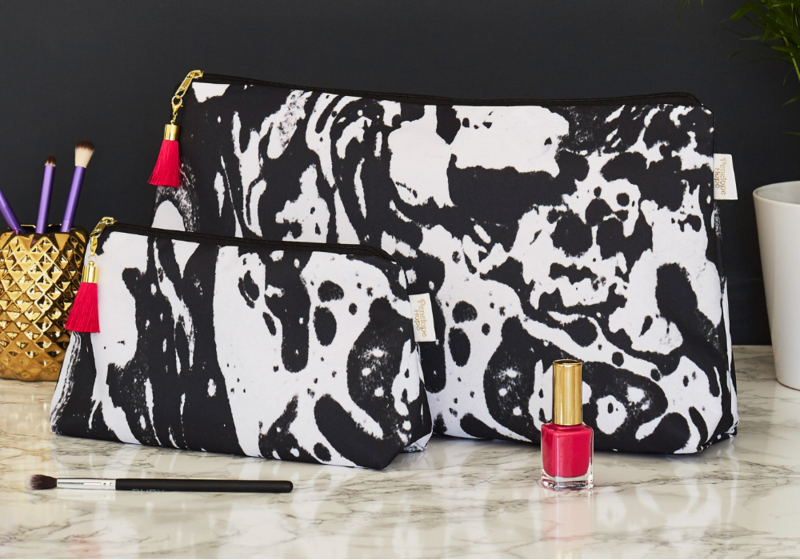 Everyone likes a little monochrome right, and this this set couples a marble print too. One thing to watch out for is the detailing on the Penelope Hope pieces. Just look at that gorgeous contrasting tassle. Above, you can see the gold foil monogram too. Each bag can be personalised as part of your prize making this gift just that little bit extra special. Just let us know the initials you’d like to include on your prize and we’ll get to work. 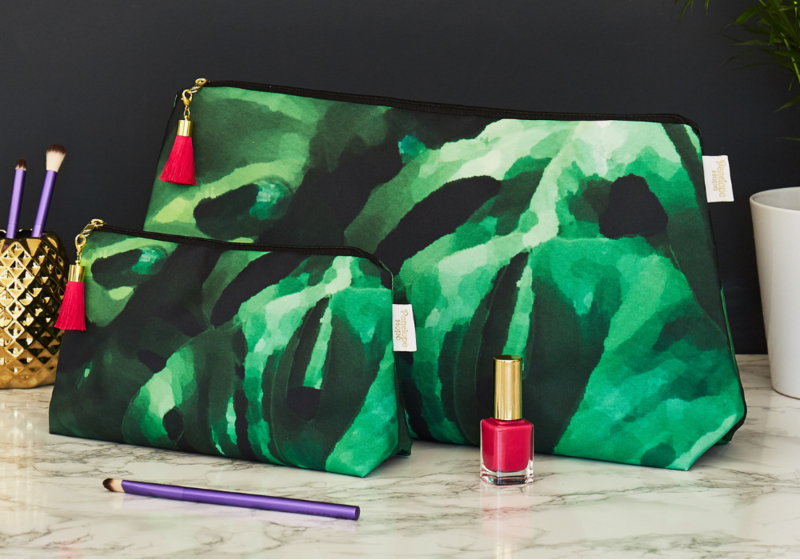 The Mesmerise set design was created from an original watercolour painting by Penelope Hope founder, Nadia Newton. It features a striking palette of blues, aqua and a touch of lilac. These water-resistant wash bags have been created to be super practical and stay looking in tip top condition even after many uses. 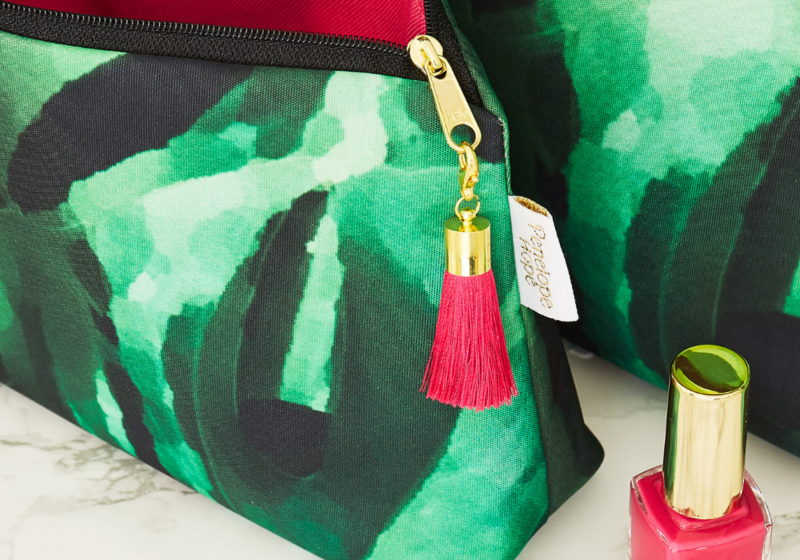 The water-resistant fabric is great for bathrooms and trips to the pool or beach, which makes this wash bag perfect for travelling, such as a girls’ weekend away or jet-setting off on holiday! You can shop the full Penelope Hope collection HERE. To enter simply follow the instructions in the rafflecopter widget below. You’ll need to leave answer the question and leave comment on the blog to make sure you are entered. Then if you’d like extra chances to win you can follow us on social media – we’d love to stay in touch! I’ll choose a winner in a few weeks’ time and then you can choose your favourite from my top 3 above, and the lovely people at Penelope Hope will send you your monogrammed washbag set directly to you. In my bathroom! They are so stylish! This would be lovely, I can never fit everything I need into one bag, I always end up with two separate ones. I’d use it on holidays or weekend breaks. When we go on holiday. i will be having a weekend away for my 2nd wedding anniversary soon and i would also use it on our first family holiday abroad this year! Perfect for my trip to hospital shortly, just looking at their beauty would cheer me up no end. These would be fab for when I go away!!! I would take them on all my travels ! Next stop The Lake District! For my weekends away, so stylish. I’m just about to paint my bathroom a lush emerald green, so I’d use these beauties there of course. They’re also the perfect size to take away on breaks. I would use them on my holiday in September. I’d give it to my sister in law for her 50th birthday this year! I’m off to Spain to work for the summer so I would take them with me. These would compliment anyones bathroom so thats where i would certainly be using mine. Wow these are stunning. What beautiful designs. I can’t bele I am going to say this but I already have 3 places I can take these. I am heading for a girls night in London next month, then we are taking the kids for a surprise overnight stay at the Zoo for their birthday and then we are off for a week to an AirBnB on the beach in Norfolk. I would use them every time I go away or visit friends. They are very lovely. I’d gift them to my daughter, she finishes uni this year and will be travelling a lot in her new job, these would be a swish start to her new life! How pretty! I would take these on holiday! We travel from Merseyside to Kent once a month to see our daughter and granddaughter. Because it’s quite a long journey, we usually go on Thursday and come back home on Monday or Tuesday. These bags would be perfect to use for those trips. If I was lucky enough to win one of these exquisite bags I would use it on my weekend trips home to visit my parents. I have a few weekends away planned for this year these would come in very useful. I’d take them away on holiday. On my holibobs in the South of France – a girl needs to stand out there! I often go away for short breaks rather than long holidays, so these would be ideal for me! I would love to win this for my daughter’s birthday, she will be 40 this year and travels all over the country working so this would be perfect. I would use them at home and for when I go away, they look great! I would use them when I go and visit family in South Africa. Just a little more saving to do. We are going to a beautiful hotel in Devon for a couple of nights for my birthday. This would be ideal for this. I would use them in my bathroom for my creams etc.. they’re lovely! I would use them on my best friends hen party! Would use them on holiday, or mini breaks. They are lovely. It would be great for my holiday! Not too sure yet – hoping for a last minute holiday somewhere with some sunshine. These are classy! Perfect for holidays and when visiting friends and family….super designs! I’d use them on my summer holiday that I’ve just booked! When we travel around Scotland in summer! I will use them on my next holiday to cyprus. I am going on my first ever cruise to celebrate my 25th wedding anniversary. They would travel the Mediterranean with me and they would bring a touch of sophistication to my usually beige contents of my suitcase. At home or when I go on Holiday. I’d like to use them on holiday. I would use them when we go on holiday in the Summer. I’m going away with 3 of my girlfriends later this year. Its our long awaited first holiday together. I’d love to win these fantastic bags to go in my suitcase. I would give them to my daughter as she is going to Australia for a year. These washbags are beautiful and i would take them with me on my holiday to Devon in the spring. I would use them for when I head off on a weekend away! I’ve been needing a new wash bag for ages! We love to travel, everything from overnighters to three weeks long haul, so this prize would go worldwide. This would be used constantly. For my holiday, my sisters wedding and for when I go away for work! Handy for taking with me on the go when I don’t have time to get ready properly because I’m getting the baby ready! These washbags would be fab for holiday on the coast! I do a lot of travelling with work, so they would follow me around on business. On my travels and believe me there is a lot of them!! First stop Iceland in a few weeks!! I would use these on my first trip to New York! When I next go on holiday. To store my makeup in style for my bathroom. Everyday with for my make up and face creams. They would certainly brighten any morning up! I would use these gorgeous washbags whenever I am away from home. I need something amazingly beautiful like this for when I go to Monaco! I would use these lovely bags on holidays, weekends away, and special trips. 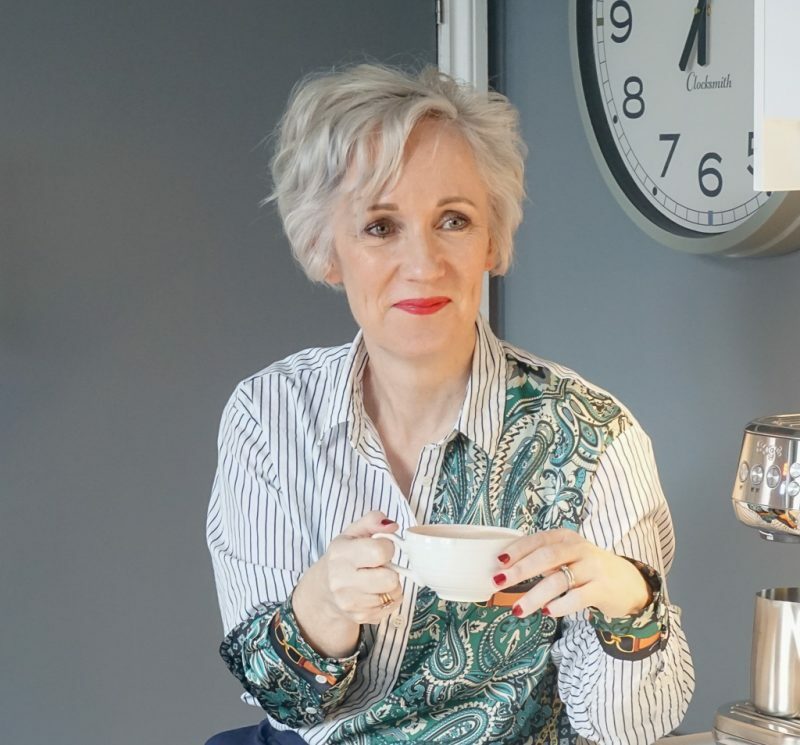 Hey, I'm Jen Stanbrook, a 40+ freelance blogger with an insatiable love of fashion, beauty and self-care.